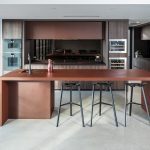 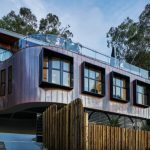 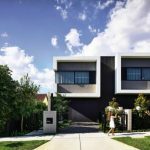 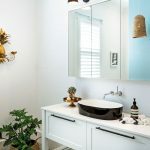 The homeowners, a professional well-travelled family who work and live between Australia, London and Hollywood, wanted to achieve the same hotel-style luxury at home as experienced on holidays — a modern design with classic elegance — and that’s what they got! 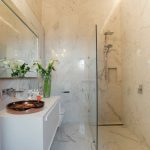 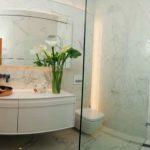 They requested a bathroom with timeless finishes, lots of space and abundant light, which also complemented the home’s architecture. 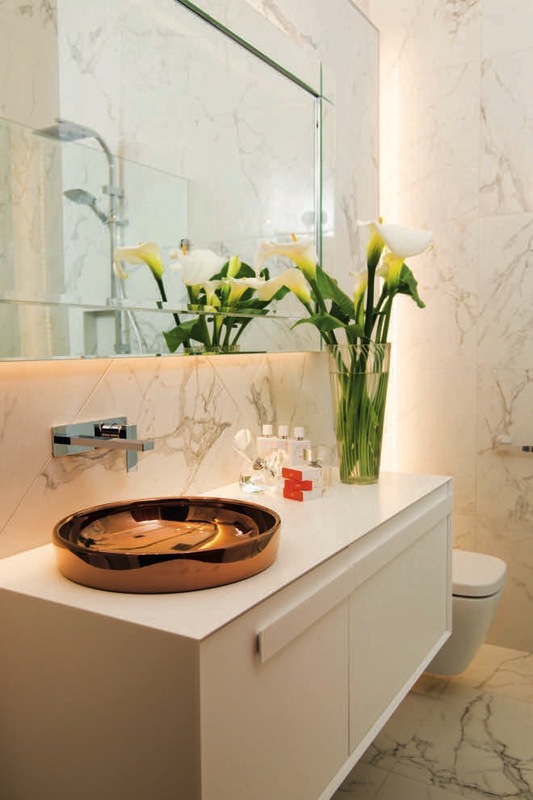 This was all taken into account when designing this gorgeous room. 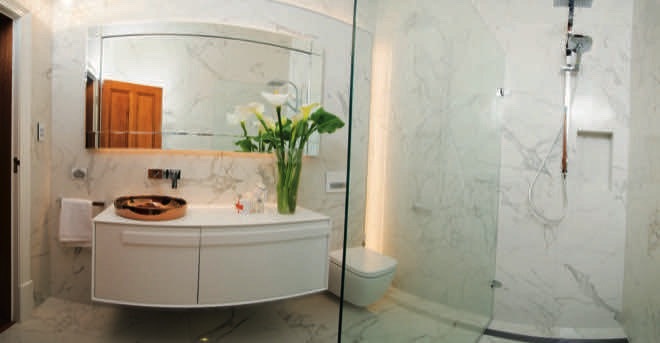 The original space was worn, outdated and in need of a solid makeover. 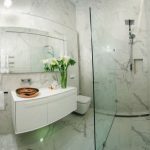 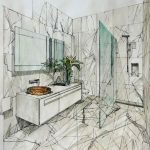 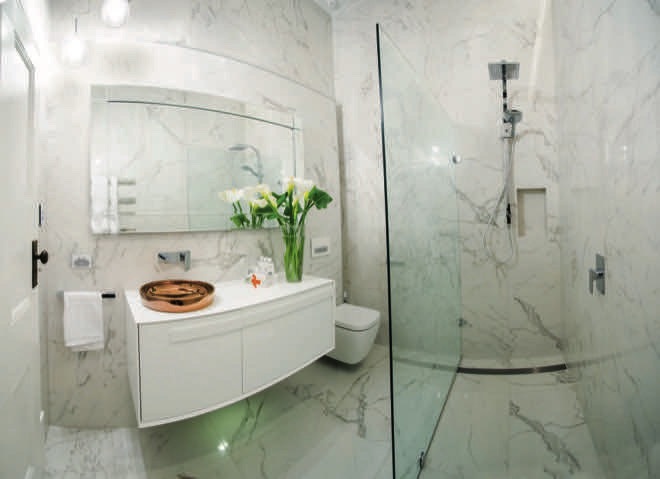 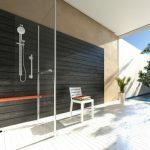 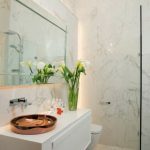 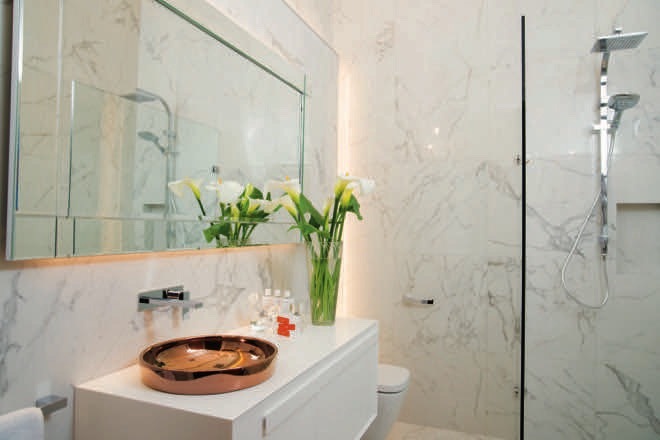 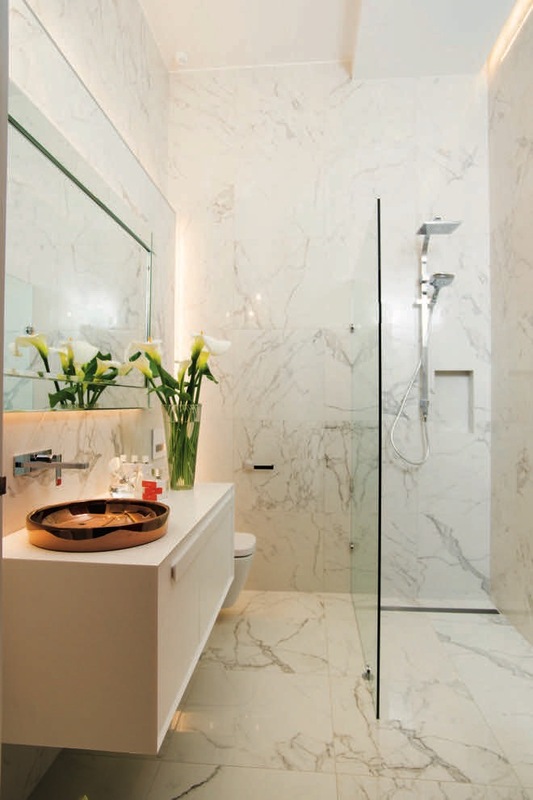 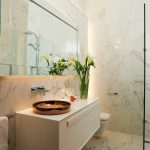 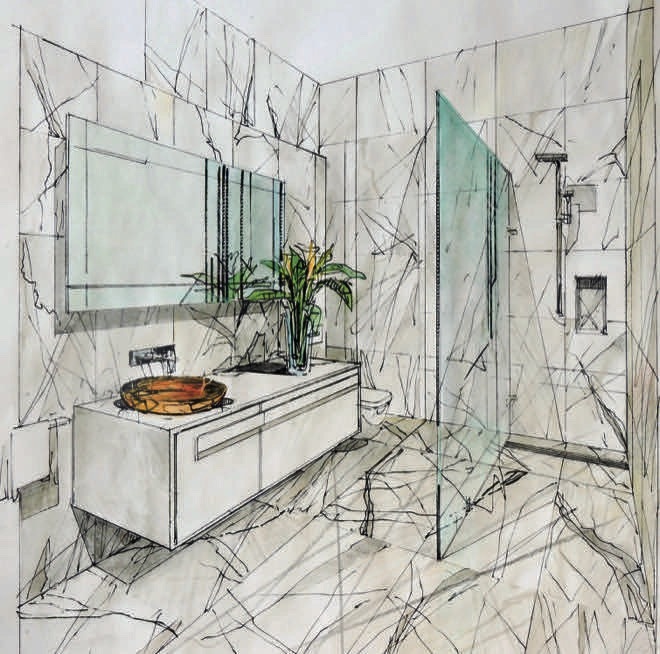 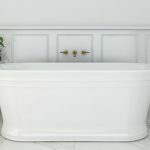 The bathroom was in the centre of the home and thus any work to the inner shell has the potential to affect adjoining rooms and compromise the building’s structural integrity, which set parameters for the design. 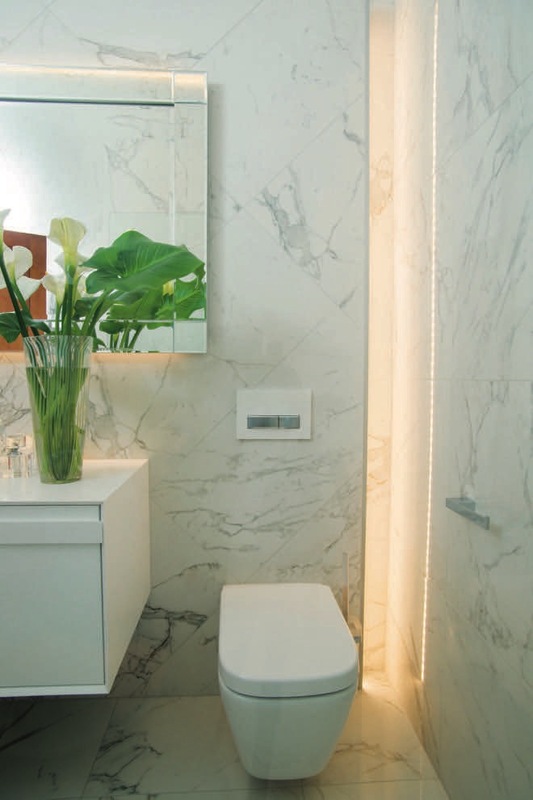 After determining the layout and location of fixtures and fittings within the constraints, installation was addressed by chemically anchoring a structural wall. 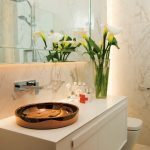 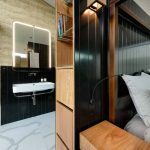 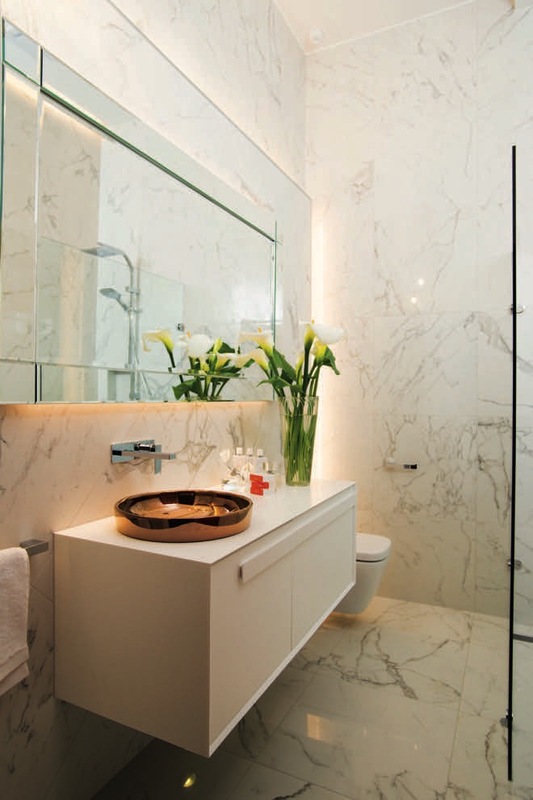 Lighting was critical for the success of this hotel-style renovation and includes a ceiling light, LED strip lighting bordering the feature wall and mirror, two clustered dimmable pendants and a downlight on a sensor under the vanity, washing the floor with a luminous glow. 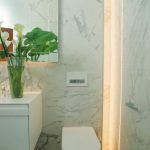 LED strip lighting was also added to the bulkhead over the shower and natural lighting was achieved by installing a skylight. 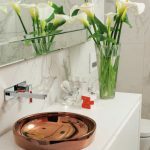 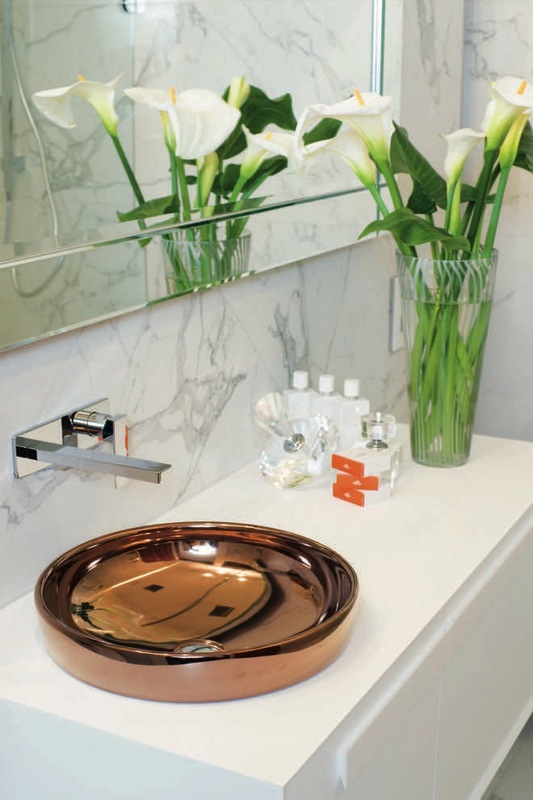 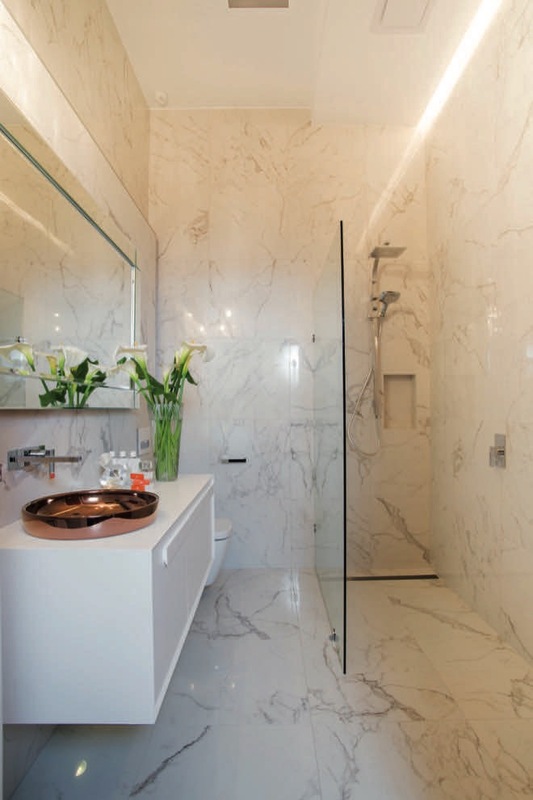 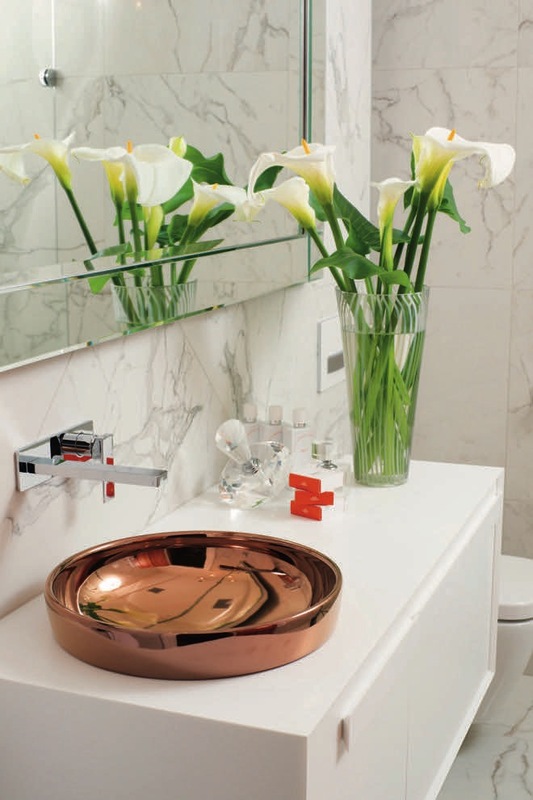 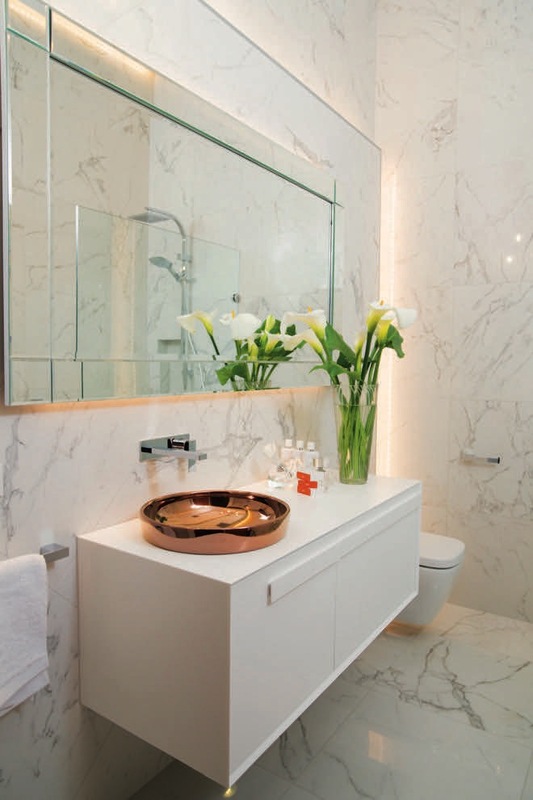 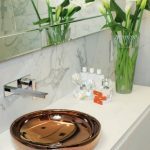 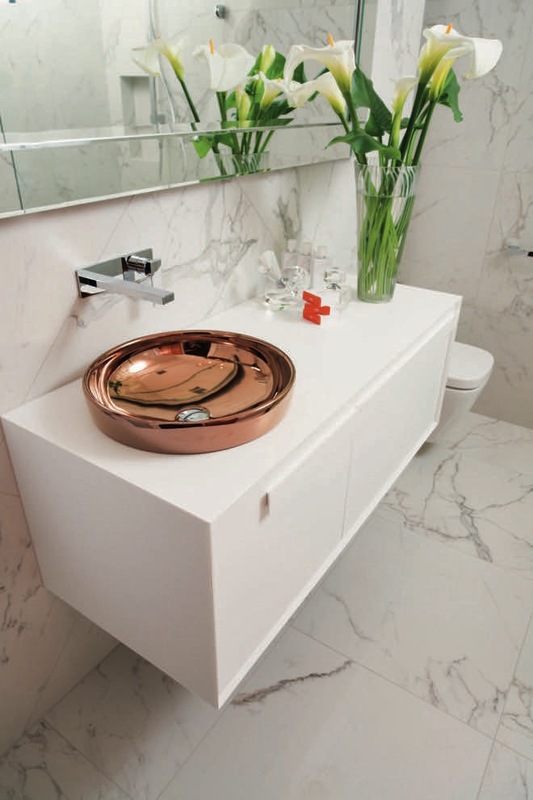 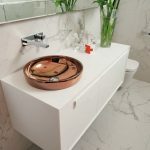 Embracing the aesthetics of the home’s architecture, Italian natural and Lappato porcelain tiles were integrated into the design to play on the illusion of depth, resulting in a backdrop perfect for the copper basin selected by the clients as a statement piece. 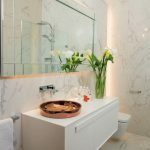 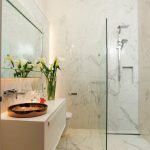 Quality fittings and fixtures, including two shower heads and a large vanity, were worked into the space to give it a hotel vibe and are complemented by plentiful natural light. 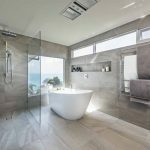 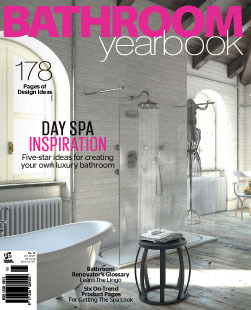 The end result is a luxurious bathing retreat, which won an award at the 2017 KBDi Designer Awards.